Devoted to Russian rock music and its capital of Leningrad, an exhibition entitled “The Time of Handbells” has opened in Moscow. RBTH reminisces about the Russian rockers who listened to the Beatles, Velvet Underground and the Cure and who created music at an uneasy time in Russia — despite the Iron Curtain. The exhibition “The Time of Handbells,” which has already opened at the Lumière Brothers Center for Photography in Moscow, took its name from a song by Alexander Bashlachev — the first Russian singer-songwriter who wanted to be a rocker. “Sash-Bash” (as his friends called him, and as he is still known to his fans) was born in Cherepovets, giving his first underground concerts in private apartments in Moscow and St. Petersburg (formerly Leningrad). Still, by common consent he is regarded as a St. Petersburg musician — one of those who formed the Leningrad Rock Club (LRC), a key grouping of musicians in 1980s Soviet Union. There are good grounds to claim that the hall at 13 Rubinstein Street — big enough to hold a couple hundred people — was the birthplace of what is today known as “Russian rock.” Despite the Iron Curtain and other obstacles, Soviet music-lovers still managed to get a hold of recordings by the Beatles and the Rolling Stones. Their influence led to the creation of groups like Mashina Vremeni (Time Machine) and Mify (The Myths), even though there was not yet a real venue for the rock scene in Moscow. The situation at the LRC was fundamentally different: here, Moscow’s Konstantin Kinchev (leader of the Leningrad group Alisa), Yuri Shevchuk from Ufa (DDT), Boris Grebenshchikov (Aquarium) and others got along easily, together under one roof. This cosmopolitan grouping immediately produced a special creative atmosphere — a kind of squatter community in which individuals tried to the utmost to express themselves. The diversity of the association also suited its organizer: the LRC’s invisible patron was the KGB, though it did not interfere in the club’s activities. This fact was revealed to the general public later in the period of perestroika, thanks to an admission by retired KGB Maj. Gen. Oleg Kalugin. Still, in the 1980s, the Rock Club was reminiscent of something akin to the floating community in Richard Curtis’s film, “The Boat that Rocked” — a jolly bunch of squatters, amongst whom, between drinking bouts and friendly pranks, the history of Soviet rock was being written. Today, Russian rock is a phenomenon not so much of art as it is of public life. DDT and Televizor (TV) — both groups that were part of the LRC — perform at “March of the Discontented” protests, while the views of Grebenshchikov and Kinchev are sought out in the context of political events. Yet 30 years ago, each of them was, above all, an independent cultural entity and a creator of their own style. The exhibition in Moscow is about the people, rather than their music. The most influential of the Leningrad musicians was — and still is — Boris Grebenshchikov, the leader of the rock group Aquarium. Naturally, the group’s position of seniority means the exhibition has more photos of Aquarium than of any other group. At the end of the 1970s, Grebenshchikov began to transplant onto Russian soil the acoustic experiments of David Bowie and Bob Dylan; at one time, he even sported a hairstyle inspired by Andy Warhol. Grebenshchikov took his musical foundations from Anglo-American musicians and tried to build on them with lyrics grounded in the Russian poetic tradition. In this way, he laid down the basic creative principles that his younger colleagues went on to follow. The next cultural milestone after semi-acoustic rock was, of course, New Wave. Rock bands like Alisa, Televizor and Kino (the word means “motion picture” in English) were very involved in adapting this style. 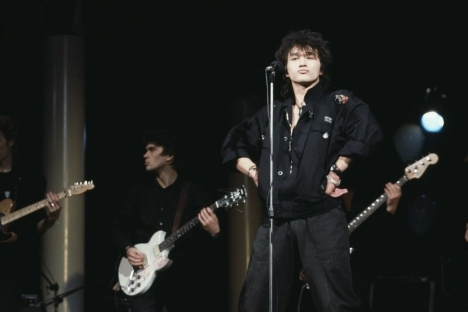 The latter, Viktor Tsoi’s group, is still considered one of the best Russian rock groups of all time. The LRC also had punk groups, such as Avtomaticheskiye Udovletvoriteli (Automatic Satisfiers), Narodnoye Opolcheniye (People’s Militia) and Obyekt Nasmeshek (Object of Derision), as well as the avant-garde bands Strannye Igry (Strange Games) and Avia (Air); in addition, it included the beat quartet Sekret (Secret), whose members had taken over the Beatlemania baton from Mashina Vremeni. Besides these groups that were largely cover bands, the Rock Club also spawned several completely original acts. First and foremost, these were Auktyon (Auction) and Nol (Zero). The former group started with New Wave and very quickly developed their own style, based on jazz-rock, American avant-garde jazz and the experimental Futurist poets of the early 20th century — Alexander Vvedensky and Daniil Kharms. On the other hand, Fedor Chistyakov, the leader of Nol, was a virtuoso accordion player and relied on purely Russian melodic styles, urban folklore, and the natural grotesquery of popular culture. Unfortunately the end of the Soviet Union — which, among other things, promised the rockers more creative freedom — also proved to be the end of the golden era of the Leningrad Rock Club. Not all of them lived to see what they had dreamed of: Bashlachev died in 1988, Tsoi in 1991, and, in 1992, Chistyakov attacked his girlfriend with a knife and went to prison. Groups that had once held ambitious dreams of international fame occupied a nostalgic musical niche instead. Some even came to the exhibition in Moscow to recall the old days: Boris Grebenshchikov, for example, gave an impromptu concert, and Oleg Garkusha from Auktyon read poetry.